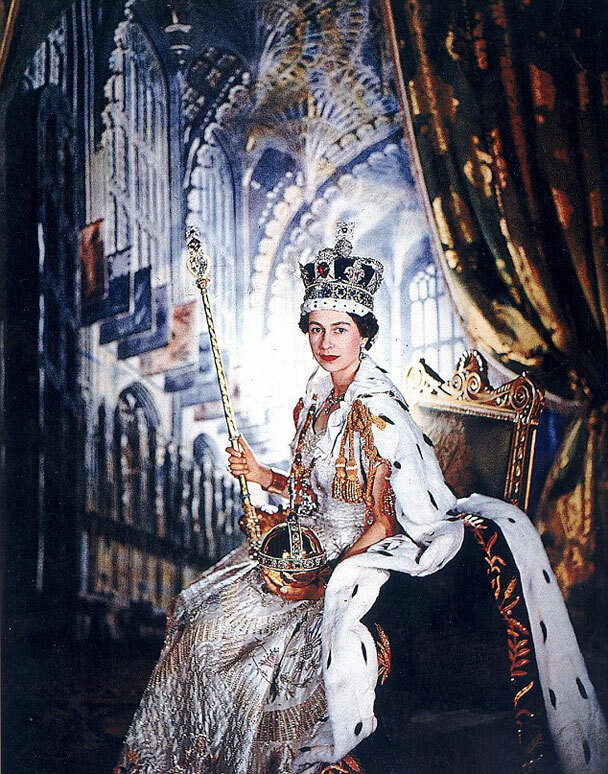 The Coronation of Queen Elizabeth II took place 60 years ago today. I had looked forward to it for about a year after reading about the history and traditions, in The Illustrated London News special issues and weekly editions, in Mum’s copies of The Australian Women’s Weekly (and it was weekly in those days) and in newspapers and in newsreels at the two picture theatres in Mount Gambier. In those days we didn’t have television in Australia, so we listened to the BBC radio broadcast relayed via the ABC. And in those days you had to buy an annual licence to listen to the radio. They had inspectors travelling around in vans with equipment to detect if any homes were receiving radio and didn’t have a licence. 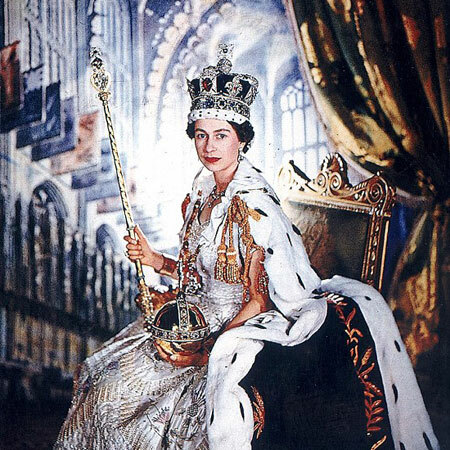 So, on the night of Tuesday, 2nd June 1953, at our home in Mount Gambier, my parents and I listened to the Coronation of our Queen on the radio. Bear in mind that the Coronation service is a solemn religious ceremony with a Holy Communion service forming part of it (a Mass in Roman Catholic terms), and that the Queen is the Head of the Church of England. I am an Anglican and did my Catechism training and was attended a service of Confirmation in 1949 conduction by the Bishop of Adelaide. So bear in mind that the Queen is not only our Head of State but is also the Head of my church. My father was a church warden and did a lot of work for the local church, including organizing working bees. 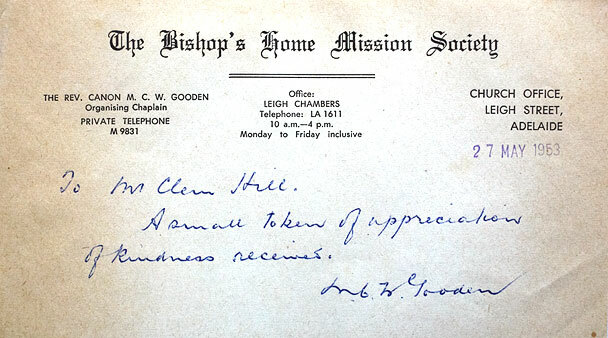 He followed the Coronation service during the radio broadcast with a book presented to him by Canon Gooden. And here is the book, albeit a little faded after 60 years. 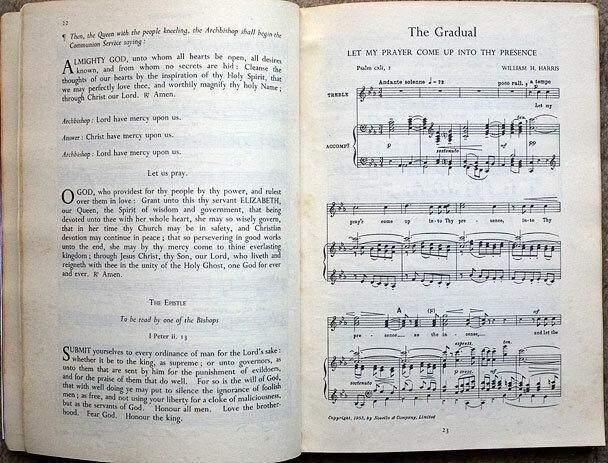 The above photo shows some of the text of the service and then the music that follows the prayer on the left. A large part of the book is taken up with the music pages. 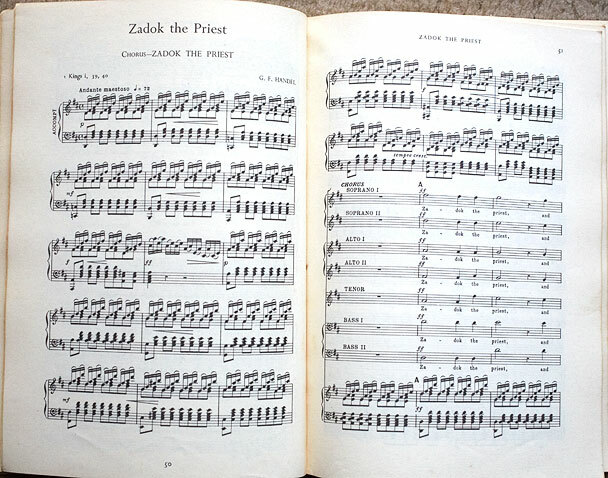 One of my favourite pieces of music from the Coronation service is Zadok the Priest by Handel. It follows the Anointing. I am now going to let you experience part of the Coronation service as we heard it on the radio. Firstly, the Introduction to the broadcast by the Archbishop of Canterbury – in which he explains the importance of the Anointing – and then that part of the ceremony. Oh yes, it’s years before stereo. But this is a recording of the real thing. And unlike many (dare I say most) recordings of Zadok the Priest, this one ends with a huge church organ coming in. Note the volume control on the left of the audio player. At the end of the service there is a Recess in which the Queen and her six Maids of Honour withdraw to the Chapel of St Edward the Confessor behind the altar. The Commonwealth Prime Ministers and some senior members of the Royal family and the Duke of Edinburgh then begin to leave in a formal procession. This is the first recording below. In the second recording the Queen then emerges from the Chapel with her Maids of Honour to the sounds of God Save The Queen. She is wearing the Imperial State Crown and is wearing a long purple and ermine train. The Queen emerges from room behind the altar in full regalia. Shown above is my set of 3 LPs of the complete service. 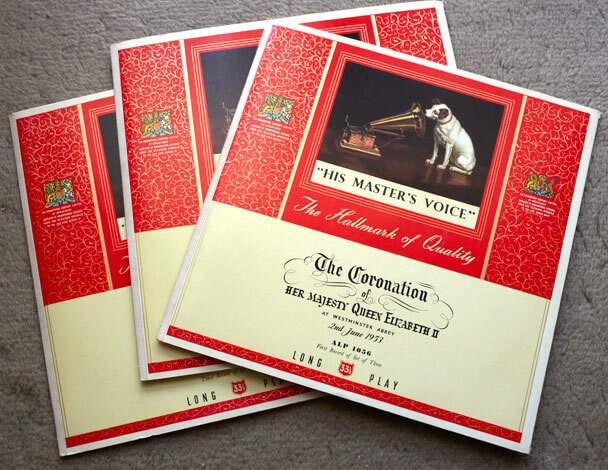 Each album cover has a royal Coat of Arms on the left side of the “His Master’s Voice” logo and a royal Coat of Arms on the right side of the logo. They are both different. The one on the left is the Coat of Arms of King George VI, and the one on the right is that of his mother, Queen Mary. The mp3 recordings in this post were recorded from the CD version of the above albums. 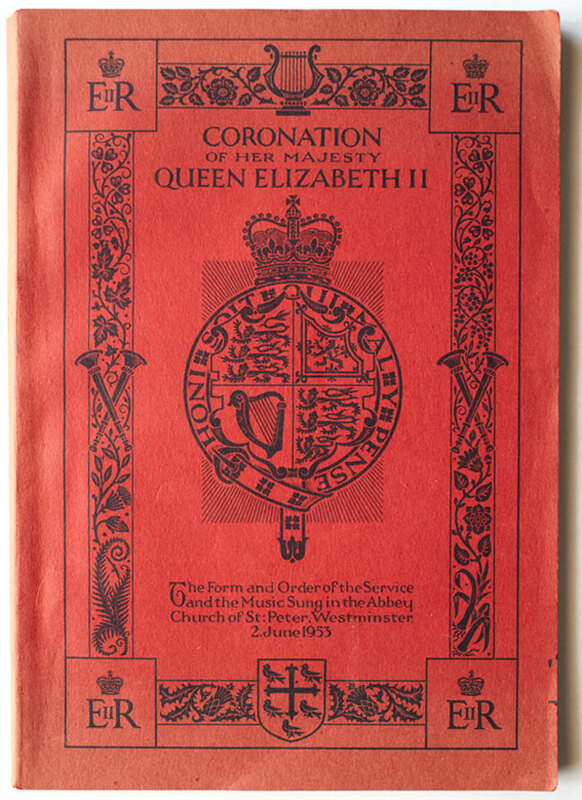 Interestingly, the Coat of Arms and wording relating to the appointment by Queen Mary is shown a little smaller on the record album cover than that of her son King George VI. It reminded me of the late 1960’s and early 1970’s when I used to assist with the preparation of the Elders-GM annual report. On the pages on which the names of senior executives were listed, very careful attention was paid to the size of type and location on the pages for each of each name according to the status and hierarchical ranking of the executive concerned. On the HMV record albums, I suspect there is a distinction between the appointments by King George VI who was a sovereign, and Queen Mary who was a Consort (of King George V). A week or so after the Coronation black & white newsreel footage was shown at the two picture theatres in Mount Gambier, but it was a while before the feature length colour movie A Queen is Crowned arrived and was shown at the Odeon theatre. Please note that this documentary is feature length – about 70 minutes – not full length. Large parts of the Coronation service have been shortened or left out entirely, including most of the prayers, the Communion service and hymns. 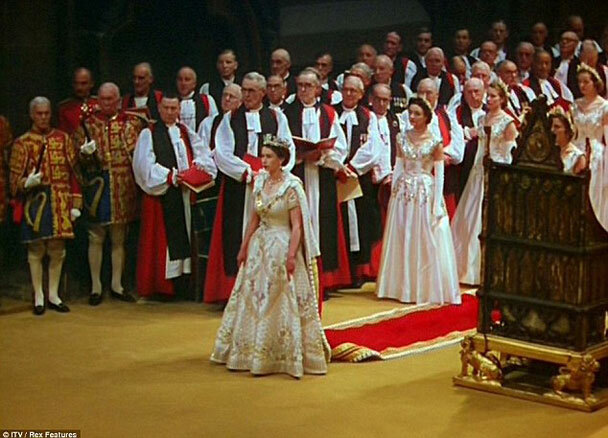 As an example, the Anointing is mentioned, and the Queen is shown dressed in the white robe for it, and we see four Knights of the Garter bring out a canopy of cloth of gold for the Anointing, but the words of the Archbishop and the Anointing itself is not included, nor the music and singing of Zadok the Priest immediately afterwards (as you can hear in the Anointing recording extract above). But the documentary plays a little of this music at an earlier part of the service where the Queen moves to kneel at the Altar to kiss the Bible and a document confirming that she will keep the Oaths she has just taken. Something to think about when watching the service is not just the pageantry and ceremony, but the reasons behind the Recognition, the various Oaths and the Anointing. If you have watched the TV series The Tudors or other TV series or movies about the times that followed, or read about them, you’d know that it would be wise to get the new monarch to take some oaths to protect the people and the church, and to kiss the Bible and sign a declaration promising to keep those oaths. But in those days, I suppose the ruling monarch, be it King or Queen, took their oaths as seriously as politicians these days keep their election promises. 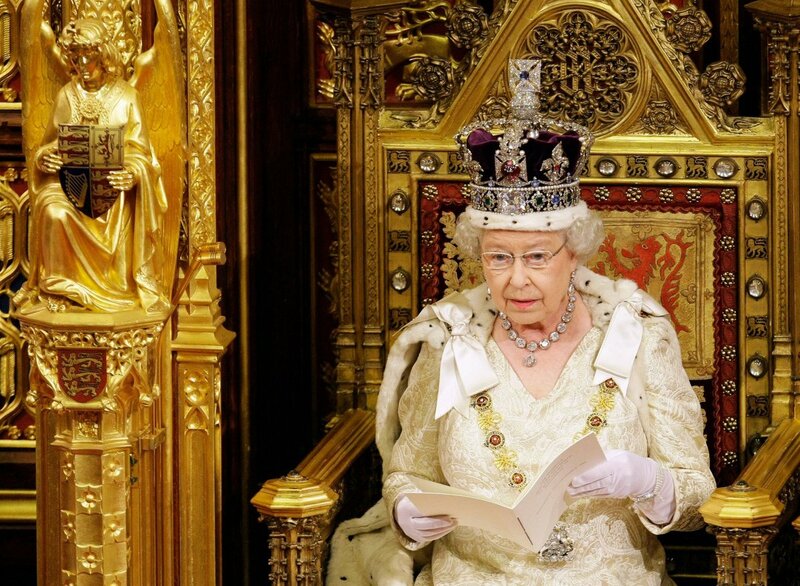 Queen Elizabeth II has kept all her oaths. Another thing to think about when watching the Coronation service is to note all the robes and trains the Queen wears from the time she leaves Buckingham Palace until the time she reappears after the service from the Chapel of St Edward the Confessor and follows the procession leaving the Abbey. Also, when leaving the Palace she is wearing the George IV diadem, and then is crowned with the heavy gold and gem encrusted St Edwards Crown, and finally leaves wear the Imperial State Crown. It must have been difficult to remain totally poised and composed for so long, under such close scrutinity. If you would like another way of looking at the above video, where you can select each part of its 7 parts individually, then go to the YouTube link here. 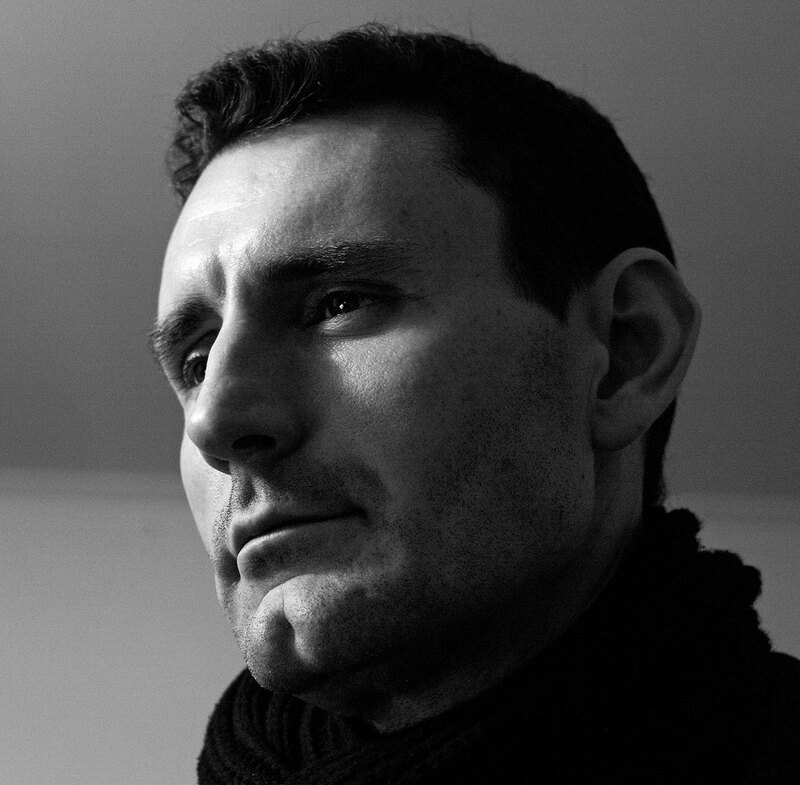 The following is a much shorter, black & white film of the Coronation. 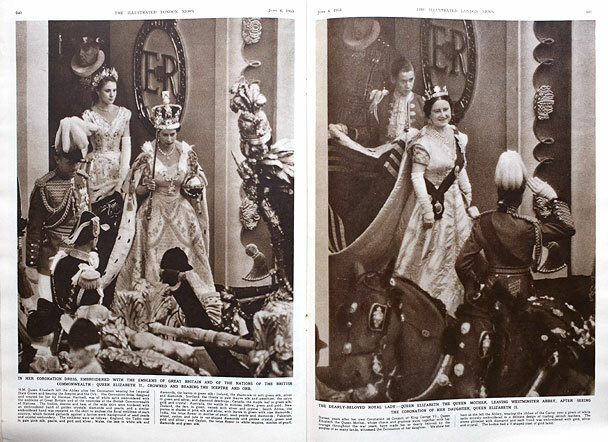 One of the double spreads in this issue was about news before the day of the Coronation. 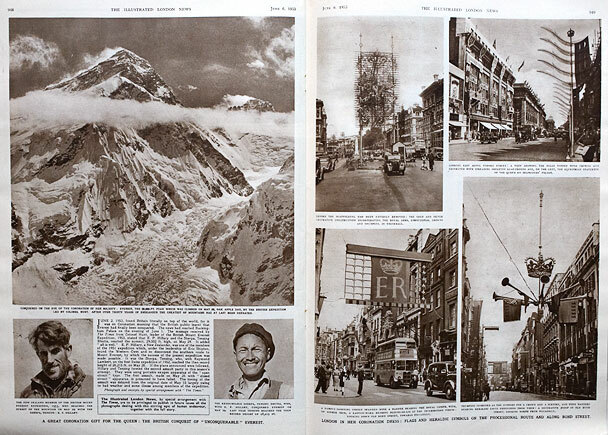 The left page was about the historic climbing of Mount Everest for the first time, and the right page showed more photos of the decorations in London. The capital cities in Australia also had some decorations. The 60th anniversary of the climbing of Mount Everest and reaching the summit on 29 May 1953 has received a lot of publicity in the past week on the date of the anniversary. 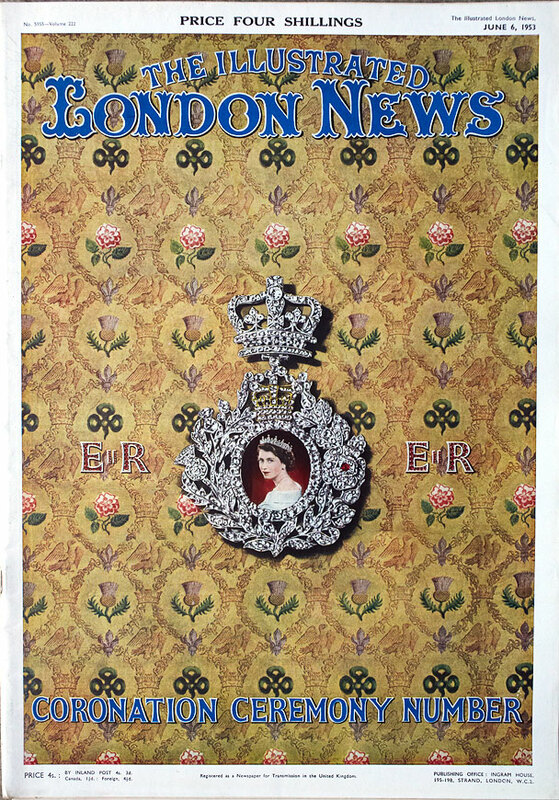 However, in 1953, the news of this historic achievement did not reach London until the morning of the Coronation. 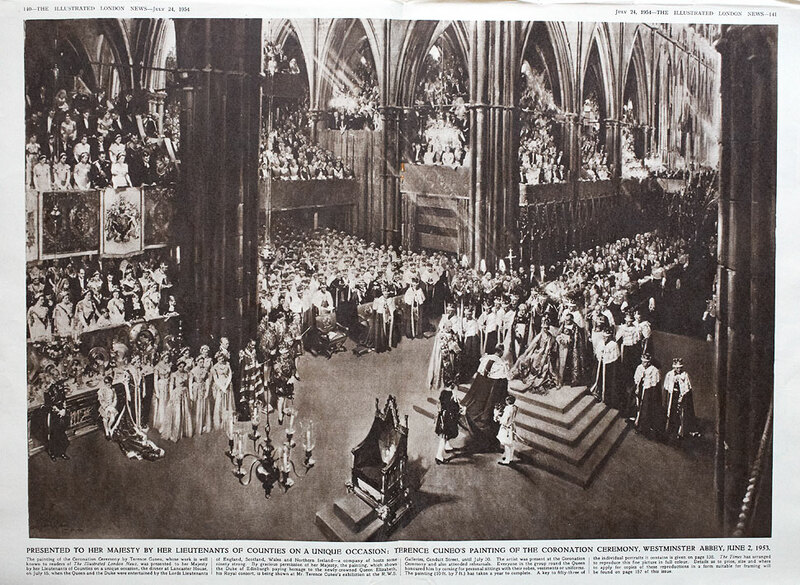 The above spread shows the Queen seated with her Maids of Honour for taking the Oaths; below that the Queen’s red train has been removed and she is now wearing the gold cloth robe for the crowning and the overhead photo on the right shows the whole scene in the Abbey at the moment of crowning, with St. Edward’s Crown raised above her head. Here is a sketch of the same scene, at a lower angle. The Archbishop and the Queen are to the left of the middle of the spread, with the Queen seated on the chair of St. Edward the Confessor. 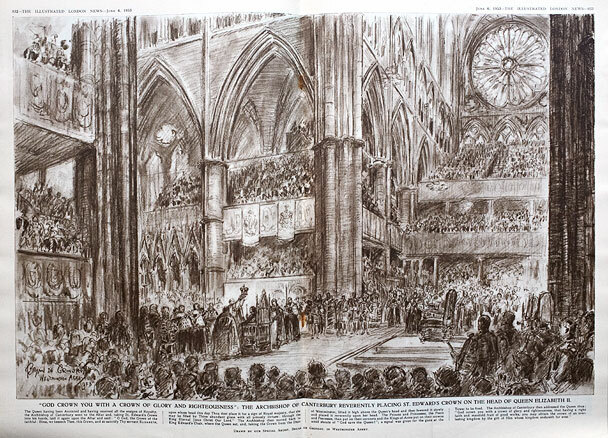 On the right page is the throne, which the Queen is later lifted onto by the bishops. You can see the throne and steps leading up to it in the overhead view in the spread above this one. After the Queen is seated on throne, the Homage begins. A painting of it from a later issue of The Illustrated London News is at the bottom of this post. 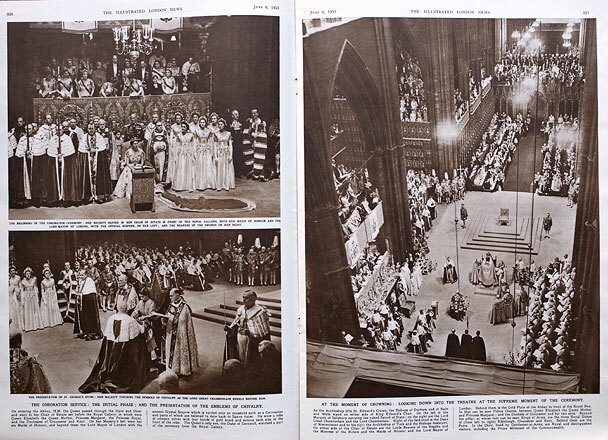 The above spread in The Illustrated London News shows photos of the Queen and the Queen Mother leaving the Abbey. The Queen’s procession after leaving the Abbey was preceded by an amazing succession of troops and military bands from all Commonwealth countries and a host of dignitaries and members of the Royal family. Sir Winston Churchill in his Garter robes was among them, and Queen Salote of Tonga was a hugely popular with the public. 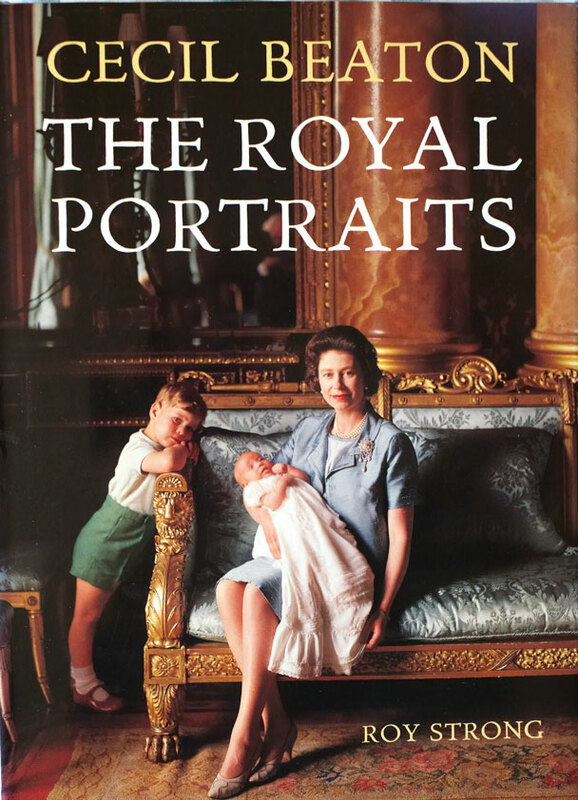 I have owned Cecil Beaton The Royal Portraits by Roy Strong since it was published by Thames and Hudson in 1988 and I saw it at the Angus & Robertson bookshop in Prahran (suburb of Melbourne). It cost $49.95 and has been well worth it for the enjoyment I have had from it over the years. It is still available at varying prices, and can be bought from Amazon.com or Amazon.co.uk if it can’t be found at a local bookstore. The author’s narrative is well-researched and well-written, as befits Roy Strong who was director of the Victoria & Albert Museum until 1987. It has 290 photos, 20 in color (although not rich colour), with some not seen before, and it includes many extracts from Beaton’s unpublished diaries, in which he writes frankly about the photo shoots / portrait sittings and his subjects. 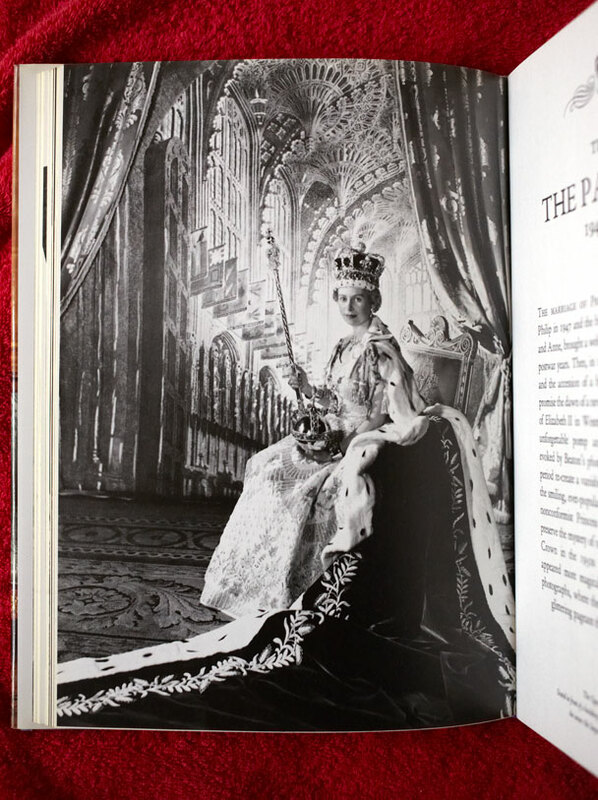 The above portrait taken by Cecil Beaton of the Queen on the day of the Coronation is probably the most famous portrait of the event. 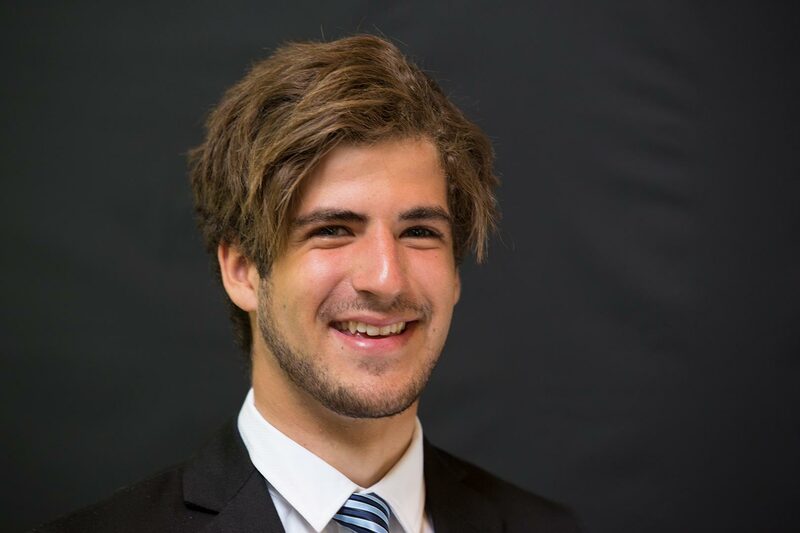 It was taken in a room at Buckingham Palace against a studio type background. 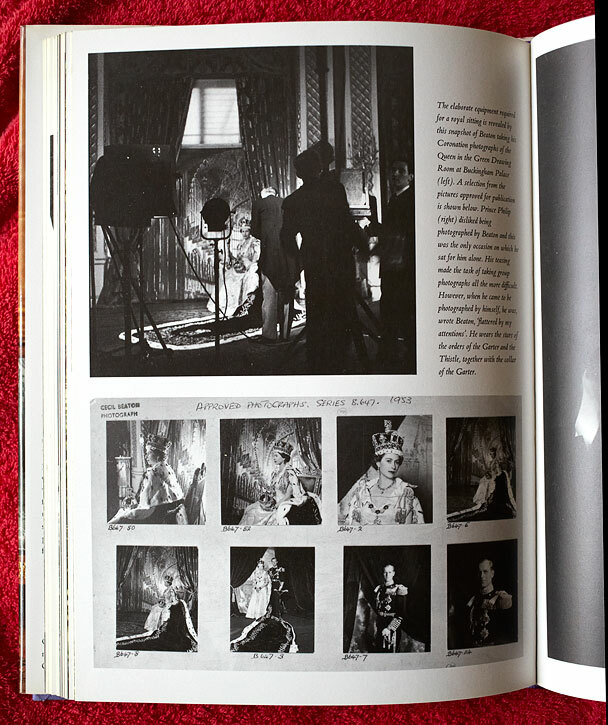 In this page of the book you can see Beaton in his morning coat taking the above portrait. You can his lighting equipment, the background, and part of the room they are in. Below that on the page are proofs of some of the approved photos he took. This might show Beaton’s proofs in the book more clearly. I could show it better if I bought another copy of the book and ripped its page out to scan them, but that isn’t going to happen. 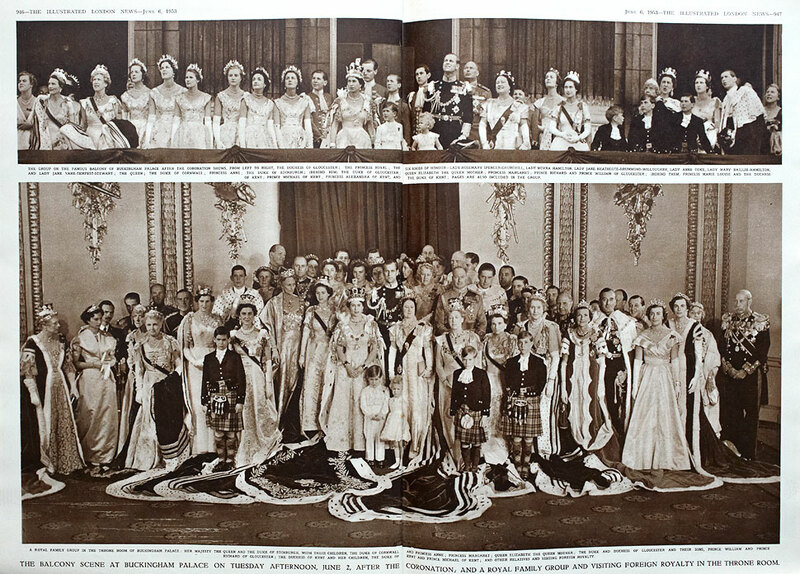 The above photo shows the Queen Mother in the robes she wore at the Coronation of her daughter. 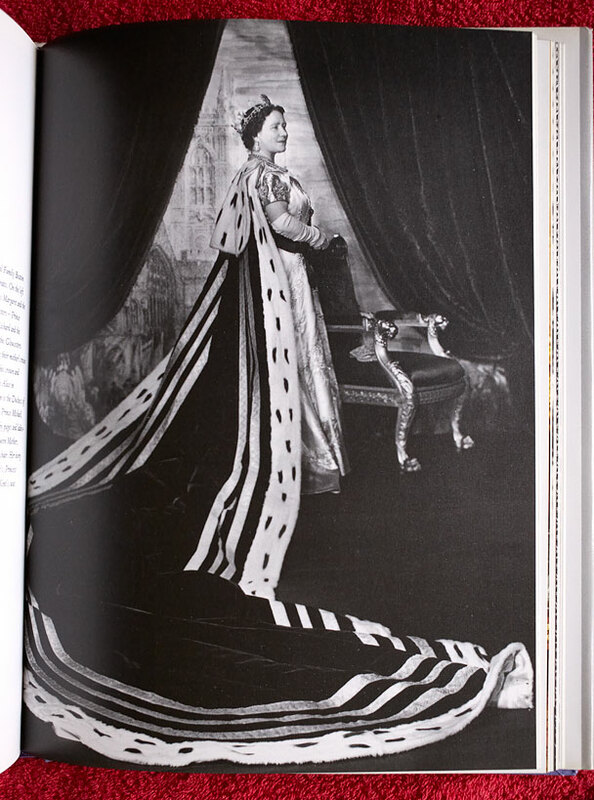 They are the same robes that she wore at the Coronation of her husband King George VI in 1937 – the year I was born. 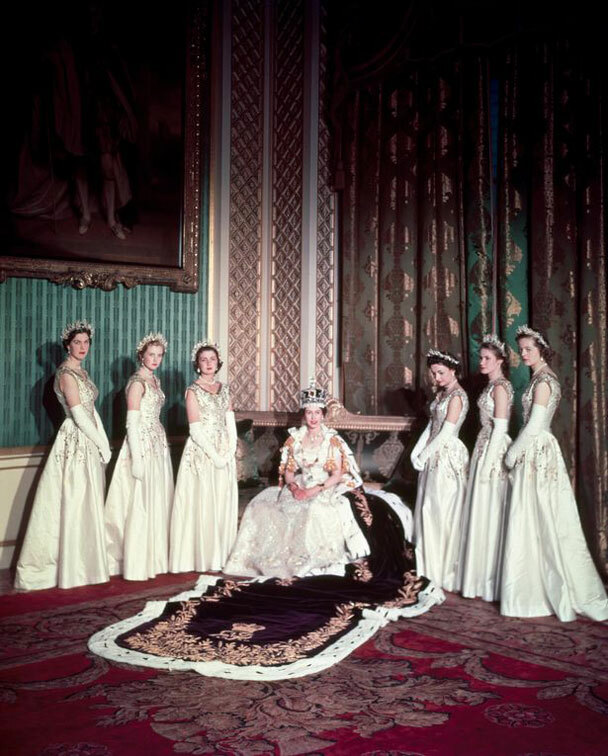 Shown above is the colour photo that Cecil Beaton took of the Queen and her six Maids of Honour. 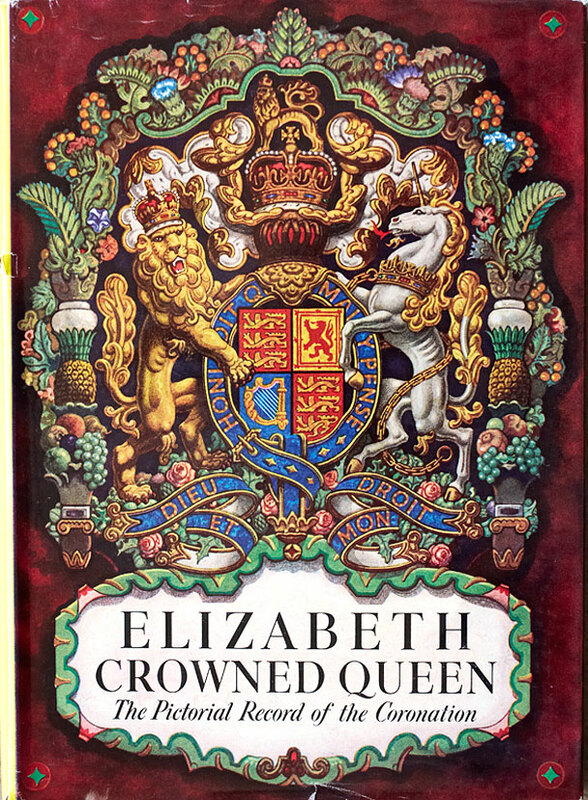 In the months after the Coronation I bought several other books about the event, and I treasure them all, but one that stands out is Elizabeth Crowned Queen. My book is in a plain cardboard carton addressed to me. I think I would have ordered the book from an advertisement in The Advertiser, Adelaide’s broadsheet main newspaper which we had delivered to our home in Mount Gambier every day, around midday or early afternoon. 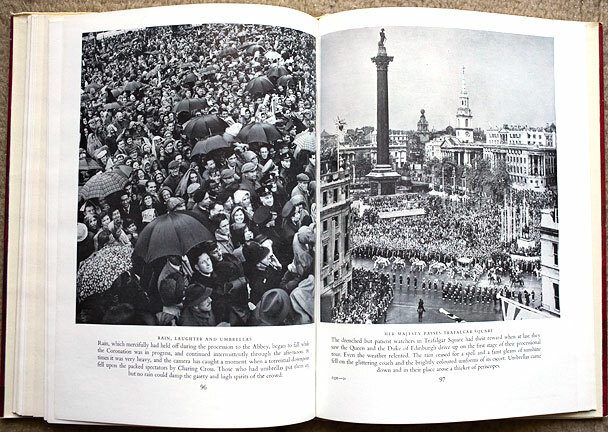 On the left page it shows the crowds waiting to see the procession – and the umbrellas needed in the rainy day. On the right it shows the Coronation Coach proceeding through Trafalgar Square. Note the huge crowds, and Nelson’s column. 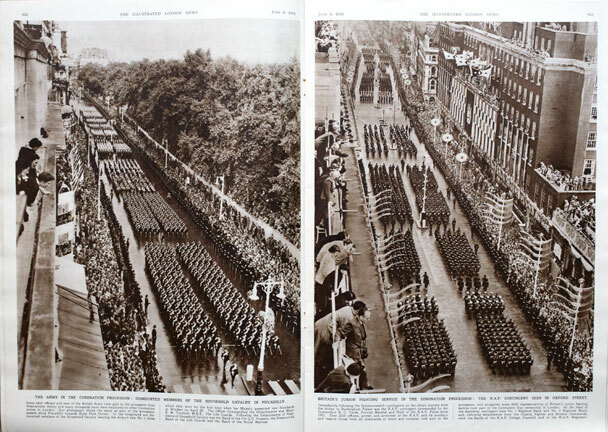 The above spread from The Illustrated London News shows the main participants in the Coronation ceremony watching the flyover from the Buckingham Palace balcony. 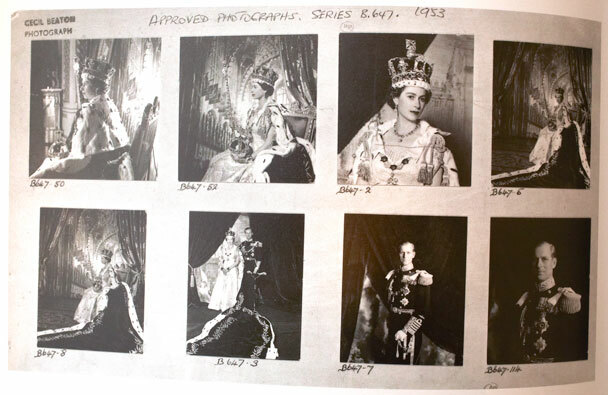 Below is a Cecil Beaton portrait of the whole Royal Family who attended the Coronation. I think this is an amazing photograph. Just think about it if you were the sovereign and this was your family. This has certainly brought me up-to-date on your devotion to British Royalty and all its traditions. Sir Laurence Olivier certainly had a great script to work with to his usual very high standard. Queen Elizabeth looked so composed at all times and her Duke looked so much younger than I have grown accustomed to seeing him. And the Queen Mother looked so proud in church and in control of proceeding on the Royal Balcony too. Listening to these recordings has made up for the lack of ceremony & documentaries on TV this time around. You have some prized memeories and keepsakes of your Father to go with this special occasion. Am I right in hearing that the words of “Zadok the Priest by Handel” included regular refrains of “God save the King”? Only thing is … I did see even one “short-tailed weasel (ermine)” in any “train” in above videos at all. Keep up the enjoyable and highly informative works John. 38. So Zadok the priest, and Nathan the prophet, and Benai’ah the son of Jehoi’ada, and the Cher’ethites, and the Pel’ethites, went down, and caused Solomon to ride upon king David’s mule, and brought him to Gihon. 39. And Zadok the priest took a horn of oil out of the tabernacle, and anointed Solomon. And they blew the trumpet; and all the people said, God save king Solomon. Zadok the Priest, and Nathan the Prophet anointed Solomon King. Unfortunately, the technology of the day used to record such a large choir in a cathedral, and then reduced to mp3 for the audio in my post, make it difficult or impossible to hear that the anthem is about the anointing of King Solomon. Solomon was played by Yul Brynner in the 1959 movie Solomon and Sheba.